Two new little dresses, available here and here. I'm ploughing through tax things, wondering as I go why I don't just keep things up-to-date and wondering why I'm wasting energy wondering about it. It's always such a nice surprise to open my books and see how diligent I was for at least half the year. Then just as I'm thinking how easy this all is, I reach the bit where I stopped paying attention and just shoved things into files to sort out later. I really do wish that I enjoyed this sort of thing, because it must be so satisfying - if it's your kind of thing. Oh well, nearly done. And at least 6 months of neat, orderly bookkeeping to look forward to! Ugh - I feel for you (having frequently been in the same place). Good luck finishing off the taxes and getting back to the good stuff! 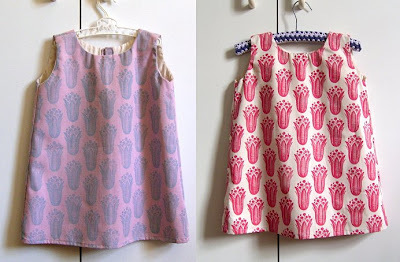 Beautiful little dresses by the way! Such pretty, pretty dresses! I especially like the one on the right, and its contrast with the hanger. Well done for doing your tax stuff yourself - I have to get someone to do it for me. I have the same problem. I guess a lot of us do. My spread sheets are current up to August, and then the is the tumbling pile of medical bills and invoices. When I look at the pile I get sick to my stomach. So much easier to turn my head and go "la, la, la". }ag moeder, hulle is oulik. jys darm maar 'n handige mens. ek haat naaldwerk.